For enquiries or to make an appointment please use the contact details below. Stephen Travers uses leading edge psychological techniques such as hypnotherapy the Havening Techniques and NLP to help people overcome anxiety based issues such as panic attacks, post-traumatic stress, fears and phobias. See http://stravershypnosis.com/services/overcome-anxiety/ for his client’s testimonials. Stephen personally presents and share stages with the world’s leading experts in the fields of hypnotherapy, personal development and neuroscience, such as Doctor Ronald Ruden and hypnotherapist Paul McKenna. He presents the official Certified Havening Techniques Trainings in Ireland and Internationally, so other health professionals can learn to utilize these amazing techniques with their clients and patients. See http://stravershypnosis.com/certified-havening-training/ about his training and workshops. Please see http://stravershypnosis.com/success-stories/ for client’s video testimonials and success stories. 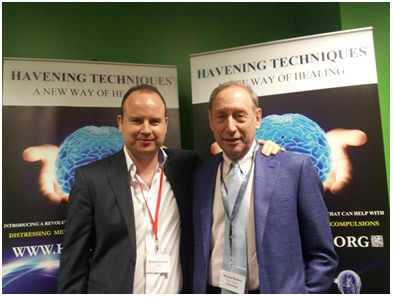 Stephen was also Ireland’s first Certified Havening Techniques Practitioner, as well as being a highly experienced and award winning Clinical Hypnotherapist. He also has been featured on Irish mainstream television, the Sunday World Newspaper and has done various other media interviews about his groundbreaking work. See https://www.youtube.com/watch?v=uu4FCcPqEvY for Stephen’s guest appearance on the TV3 Elaine daytime chat show. Stephen graduated from the Institute of Clinical Hypnotherapy and Psychotherapy in 2005 where he did his initial training there with Doctor Joseph Keaney. During the last decade Stephen has successfully helped thousands of people overcome anxiety, panic attacks, trauma, phobias, confidence and various other psychological, emotional and physical issues. He also provides a hypnotherapy weight loss program called Think Yourself Thin. He also provides consulting and coaching services to optimize people’s performance in their personal and professional development. See http://stravershypnosis.com/services/build-confidence/ for more information.